Because of the unevenness of the cuts I had to figure out a way to cover up most of the mistakes. 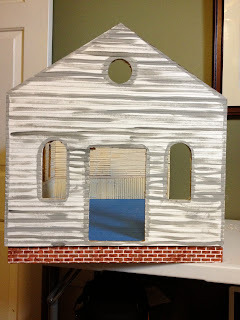 I added the trim to the outside of the bakery as I added the trim I notice that scraps resembled some architectural details that I saw on another building. 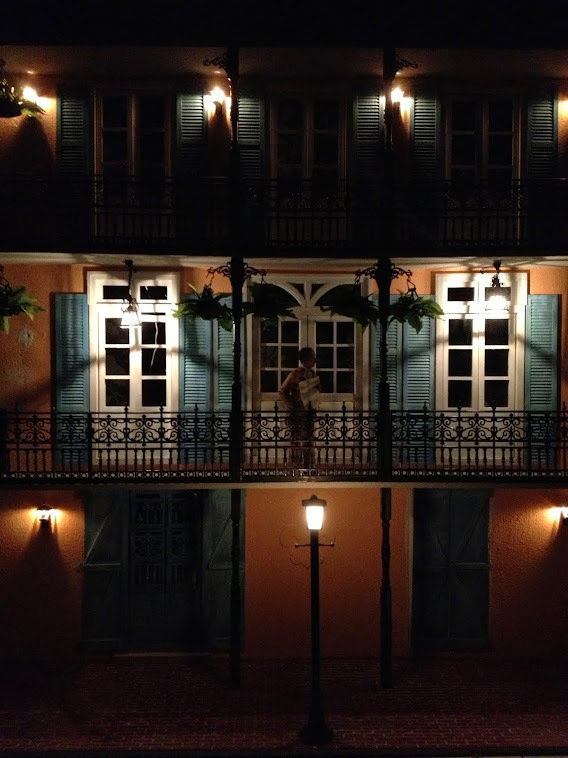 I think they are called corbels? So I tried to match up the patterns by cutting the same sections out. I added them to the tops of the windows an over the door. Well, I finally got all of the parts cut out from MDF back. 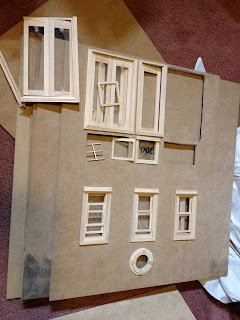 But there was problem, the windows and doors did not fit the openings, they were too small. I started by using my new Dremel 4000 to sand the openings, my first time using one EVER, got carried away with the power and made a couple of the openings too large. I will have to fix that later with trim. Then moved on to the side walk and found out that it needed about an inch and a half cut off one side and 1/2 inch on the front to fit around the bakery. So I had to call my DAD to figure out how to change the tools, Duh! I did manage to cut the side walk but very unconventionally, (too embarrassed to explain). I read an article about Bromley Stencils and that you could use regular sanded grout instead of the brick compound they sell, also from about.com. Well I tried it, it does work but maybe not as convenient as the brick compound. The cost of the grout was definitely cheaper and you get more for less money and it comes in more colors, I got Quarry Red. I did not enjoy the mess of mixing the grout with water and the protective wear required to mix the stuff. So far the consistency is about the same but did not spread as easily as the brick compound but it appears to be drying about the same time. I am still undecided. But I have decided that I need a extra large brick stencil for this project!! I started by putting light and dark gray acrylic washes on the exterior with heavy and dry brush strokes. I added acrylic paint over the top of the bricks. 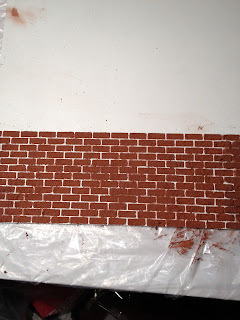 I used (1) red oxide, (2) terra cotta and (3) toffee on the bricks with olive green for moss (base coat) on the "grout". I applied the crackle medium over the dry exterior. I plan to go over the crackle medium with white acrylic in some areas when it dries. I plan to work on the foundation some more. I sprayed the steps with a stone texture paint, bleached stone, that I plan to make look like aged concrete later once it dries. 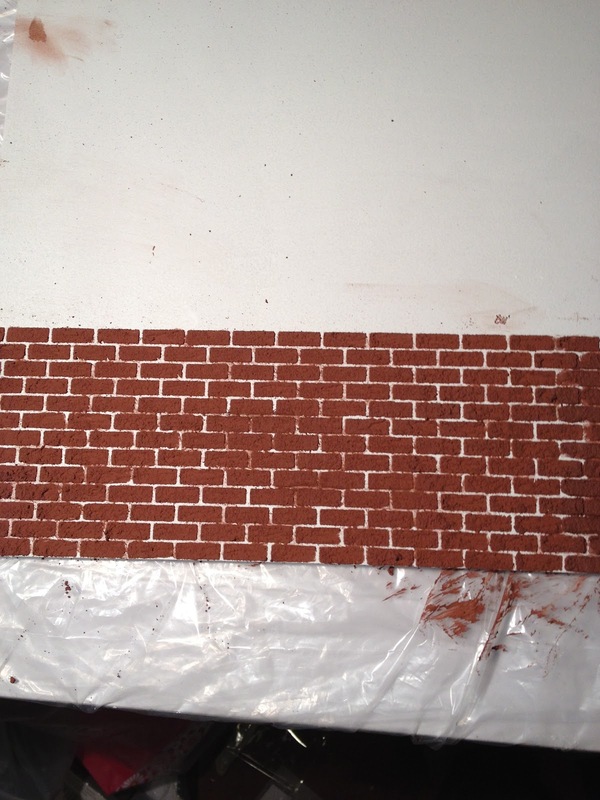 This is a close up of the bricks you can see were I applied the individual acrylic colors.